GMO Safety Studies and Funding Sources - Biology Fortified Inc.
Do scientific studies on the safety of consuming genetically engineered or GMO foods come to different conclusions if they are funded by government, industry, competing industries, or nonprofit organizations? On August 25, 2014 the first data from the GENetic Engineering Risk Atlas (GENERA) project was released, and it can help us answer this question. According to these results, the conclusions of the almost 200 studies that tested this issue from the 400 randomly selected to be a part of the GENERA beta test, the studies largely agree irrespective of funding sources. For more information, see the GENERA beta test announcement. Biology Fortified collaborated with the Genetic Literacy Project on creating this infographic based on the data from GENERA. Visit the GENERA website and search the atlas. Studies in GENERA were read and their outcomes were rated for four categories of risk: Efficacy, Equivalence, Safety for Consumption, and Safety for the Environment. The safety for consumption category includes studies that assess various aspects of the safety of consuming genetically engineered crops or products derived from them. These include feeding studies, allergenicity assessments, and studies that examine the impact of nutritional intervention with GE approaches. Each study is rated with the same terminology: Positive effect, no effect, mixed, and negative effect. Positive effect For safety for consumption studies, a positive effect means that the researchers concluded that the GE approach was safer or more healthful than non-GE crops and approaches. No effect For safety for consumption studies, no effect means that the researchers concluded that the GE approach was as safe or healthy as non-GE crops and approaches. Mixed For safety for consumption studies, a mixed result means that the researchers did not clearly conclude whether the GE approach was more or less safe or healthy than non-GE crops or approaches, and/or the data was a mixture of positive, negative, and/or neutral results. Negative effect For safety for consumption studies, a negative effect means that the researchers concluded that the GE approach had a detrimental impact on the safety or healthfulness of the food. Funding sources for each study were also categorized as to whether they came from government sources, various industries and NGOs, individuals, and unknown sources. Authors who did not disclose complete funding information were contacted to fill in the missing information. The following are the definitions for the categories of funding types. government The funding came from a national or state government agency, granting program, or state university. industry: same The funding came from a private biotechnology company that develops genetically engineered plants for commercialization, or develops traits for licensing to other companies. This also includes farmers and companies that produce and sell genetically engineered foods. industry: competing The funding came from a private company that competes for market share against biotechnology companies, farmers, food producers or retailers that sell genetically engineered foods. This also includes companies that develop products intended to replace or augment the performance of a GE crop. industry: other The funding came from a private company that does not appear to have a specific commercial interest in the sale of genetically engineered crops, nor in the sale of competing products. NGO: independent The funding came from a non-governmental organization (NGO), usually a non-profit organization, which is not affiliated with does not appear to be significantly funded by the biotechnology industry or any competing industry. NGO: same industry aligned The funding came from an NGO which is affiliated with and/or significantly funded by the biotechnology industry, which would indicate a financial dependence on that industry. NGO: competing industry aligned The funding came from an NGO which is affiliated with and/or significantly funded by a competing industry, which would indicate a financial dependence on that industry. individual The funding came from an individual person or an unincorporated association of individuals, or was self-funded. not reported This means that the funding source was not reported in the body of the study and that we were unable to reach the study authors for clarification. unknown This means that the funding source was not reported in the body of the study, and that we were able to reach the study authors but they were unable to recall or find information about the specific funding for that study. refused to disclose This means that the funding source was not reported in the body of the study, and that we were able to reach the study authors but they refused to disclose the source of funding. Each study was grouped according to both their conclusions for safety and their funding types. 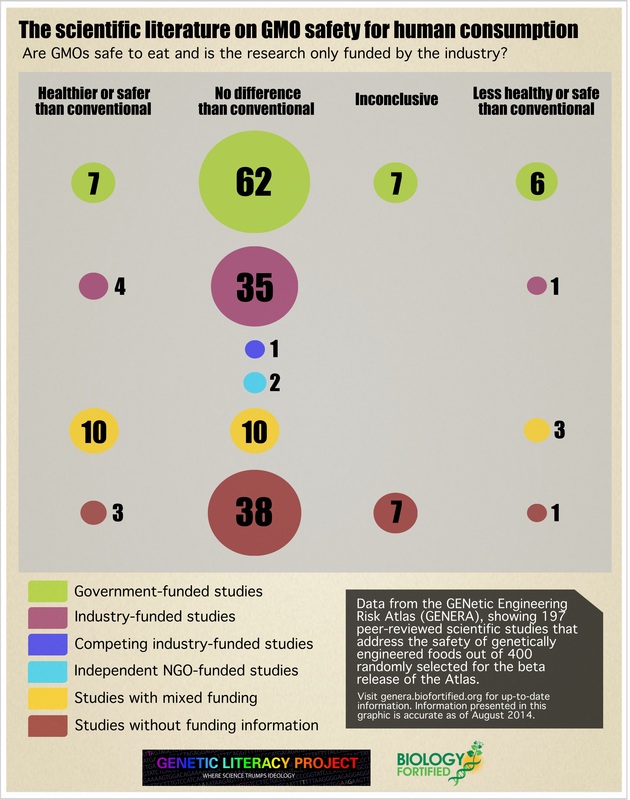 Rows: Each row represents studies that were funded by the same category of funding sources. These are also color-coded to make them easier to interpret. The size of each circle is based on the number of studies with the same types of funding sources and the same conclusions. Therefore, the relative number of studies in each position can be seen visually with both the relative size of the circle and the number inside (or next to) each circle. How to interpret this chart: It can be seen clearly that a similar pattern of study conclusions exists in each funding category. Studies that find that GMOs are as safe as non-GMO foods vastly outnumber the studies that find differences, and most differences are positive, with a small minority finding negative conclusions.